Lineu Bravo, Brazilian luthier, makes instruments for clientes all over the world. 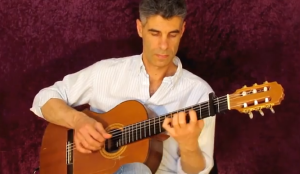 One of his international clients is Hagai Rehavia: guitarist and composer who was born in Israel. His musical influences include Brazilian musicians such as Toninho Horta and Marco Pereira (who is also a Lineu Bravo’s client). The musician got to know the luthier through Ulisses Rocha, a Brazilian guitarist. Hagai acquired a Lineu Bravo guitar in 2007: a 6-string Cedar guitar with Indian Jacaranda. Matti Caspi, Yoni Rechter and Shlomo Gronich, he started to expand and develop his own musical vocabulary and technique, influenced by Brazilian bossa nova and jazz. Delighted with Brazilian music, which he got to know from his Brazilian neighbors, he ended up visiting Brazil, and for many times he met important Brazilian musicians such as Marco Pereira, Ulisses Rocha, Toninho Horta and Raphael Rabello. In 1998, he formed a band named “Tucan Trio”. They used to perform their own compositions as well as innovative arrangements of Brazilian music. The band members are: Amir Milstein (flute), Joca Perpignan (percussion) and Hagai (guitar). The “Tucan Trio” launched an Album named “Tucan” in 1999 and performed at important music Festivals in Israel and all over the world. They also played in partnership with the Brazilian mandolin player Armandinho in Israel, USA and Brazil. Hagai has also played in partnership with the renowned Brazilian composer Edu Lobo and the Israeli Philharmonic Orchestra in 2002. Hagai’s solo album named “Bebe”, was launched in 2005, with a Brazilian repertoire. He is also an author of 4 guitar books, which contain guitar arrangements for Israeli famous classics.